Chastain provided Phase III engineering services for the new construction of a state-of-the-art, LEED certified and ADA compliant maintenance facility. Built in the 1950's, the existing 11,000 square foot facility served the Illinois Tollway's roadway maintenance, mechanic, and emergency response teams. Coordination between maintenance facility staff, construction manager, and the general contractor was crucial as service and accessibility was not permitted to be interrupted during construction, especially during the winter snow season. The new 89,000 square foot facility provided a truck parking area, eight bay maintenance service area, parts department, welding area, administration support zone, truck wash bay, and State Police headquarters supporting Interstate 294 Tri-State South. 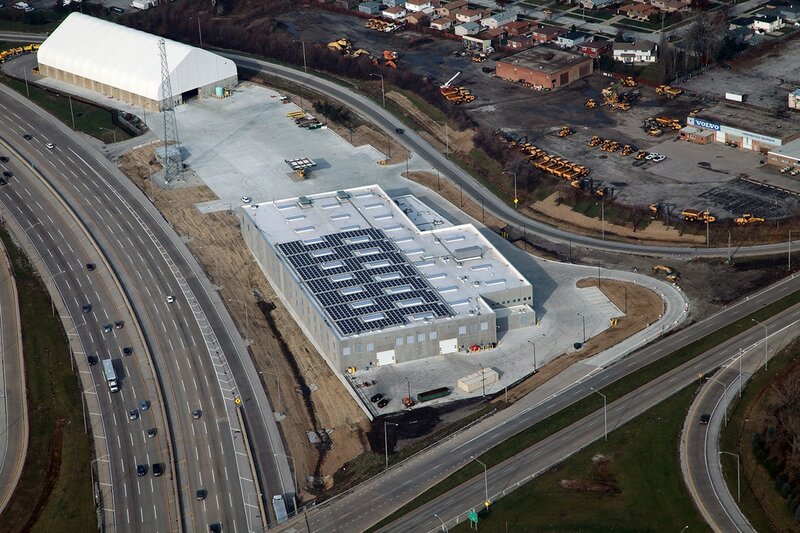 The LEED certified facility included energy efficient mechanical equipment, such as air handling units and an energy recovery ventilation system, skylights to provide natural daylight, a radiant floor heating system, LED light fixtures, and arrays of solar panels producing enough electrical energy to send back into ComEd's grid. The facility also included a separate communication shelter to house toll collection data and Motorola communication equipment. construction appurtenances included replacements of an existing underground fuel storage tank, new access ramps, and LED upgrades to Salt Barn lighting. Completed in November 2015, construction costs reached $25 million and received LEED Gold certification. Scope of work included daily on-site inspection, review of contractor lay-out including survey controls, daily traffic surveillance, geotechnical and materials inspection and testing, and as-built record keeping. Additionally, Chastain provided service to maintain project documentation, submittal review, contractor pay estimates, and Extra Work Order. This work was performed as part of a joint venture alongside Autumn Construction Services, Inc. Chastain also utilized 3D Laser Scanning technology to safely and accurately catalog current conditions before electrical and lighting improvements began. The project was organized and tracked through the Tollway's web-based Project Management System, e-Builder. Chastain was honored by the 2017 ACEC-Illinois Engineering Excellence Awards Competition receiving an Honor Award for our Phase III construction engineering services performed on this project.